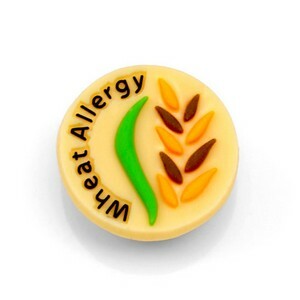 This wheat allergy button may help keep your child safe! It attaches to a hypoallergenic rubber bracelet[ (AG1000, AG1001, AG1002, and AG1003)], which are available for purchase separately. In addition to this button, up to three other allergy buttons will fit the bracelet. To attach a button, stretch the bracelet where a hole is located and insert the back of the button through the widened hole.